As some of you may be aware, Mark Sisson is running a Primal Blueprint Health Challenge throughout the entire month of August. Every day he is posting a new primal-related contest on his blog. Some contests simply require that you post a comment. Others are a bit more involved. Recently he posted a contest for the ‘best’ primal recipe video. I’ve been busier than planned this month with a variety of projects and haven’t been entering most of the daily contests, but this one caught my attention. It’s been fun coming up with new primal recipes over the past several months so I figured this would be a good way for me to get more involved in the Primal Challenge. Digging around in the fridge for inspiration, I noticed that my supply of summer squash was getting out of hand. I still hadn’t finished up last week’s share from my CSA box and received another big share that morning. It was going to be hard for just Dave and I to eat all of these (in addition to the massive amounts of other vegetables from the CSA that we fervently work through each week without the help of the children. 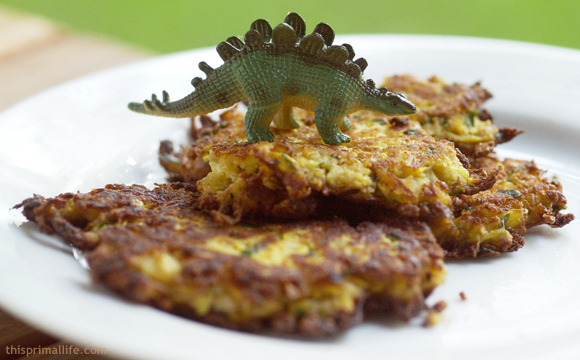 I decided to appeal to their love for shredded foods and make summer squash fritters. The first step was to whip up an experimental batch to get the ingredient proportions ironed down. I substituted almond flour for the usual wheat flour and played around with some additional flavors. In the end I was very pleased and the girls wolfed them down! They are pretty garlicky, though, so keep that in mind if youre not so fond of that flavor. Once Dave arrived home we put together a video of me making another batch. I always feel a little awkward watching myself on video, but what the heck, we can’t all be Rachel Ray. If you watch the video, you’ll notice there are lots of kid and dog sounds in the background – no avoiding that around here. At some point I’ll figure out how to enter it in Marks primal recipe video contest. The prize I checked on that this morning and found that the winner gets a food dehydrator, a pair of Vibrams, a t-shirt, The Primal Blueprint book, and a supply of Marks supplements. The whole time I thought the prize was some cooking oil! Heres the video. Recipe follows. These are delicious with sour cream or topped with chopped avocado and tomato. You could also serve them on a small bed of dressed greens. Coconut oil is my preferred oil for this type of frying. If you don’t like the taste of coconut, fear not. I have never noticed that the oil ever makes the final product taste like coconut. Oh, and you can substitute zucchini here same thing, really. Grate the squash through the large holes of a cheese grater and combine with the salt. Let sit for 10 15 minutes to allow the salt to draw the moisture from the squash. By the handful, squeeze out as much of the water from the squash as you can and spread on a paper towel or absorbent kitchen towel. When youve squeezed all the squash, use the towel to press more liquid from the squash. Transfer the squash back to the bowl and combine with the egg, garlic, parsley, chipotle chili powder, almond flour and pepper. Heat the coconut oil in a large pan until hot. Drop 3 to 4 large spoonfuls of the squash mixture into the oil and press down gently to form little pancake shapes. Let cook for a minute or so until the fritters brown around the edges and are sturdy enough to be flipped over without too much trouble. Flip them over and continue cooking until nicely browned another 30 seconds to 1 minute. Transfer to a paper towel and repeat with the remaining squash, adding more oil and adjusting the heat as needed. Is the dinosaur grass fed? Fantastic video, Shelley. Your cute kids are lucky to have such a great cook for a mother. I’m wishing I hadn’t given contestants so much time to create these videos because I can hardly wait to show them all off to MDA readers. Thank you for the plug in the video and stay in touch! great video and delicious fritters! The video mentions using almond flour but it’s missing from the printed recipe. Mark – Thanks. Can’t wait to see the other videos! Quaker – Whoops. Thanks for pointing that out. I fixed it. What a great recipe and video! Love the idea of using new veggies for fritters. Looks delicious. We welcome you to add it to our great collection of recipes on Recipe4Living.com! Hi there – I made these fritters tonight! I didn’t have almond flour so I used arrowroot flour. Hope that doesn’t totally hose the recipe. Mine turned out kind of soggy so I’m thinking that I wasn’t agressive enough in squeezing the water out of the squash. The flavor was great though! I will definately make these again and try to behave myself this time. I had the desire to dip them in something…any ideas for a sauce? I will definitely be trying this recipe. Looks delicious! Great idea! I have lots of yellow squash from our csa too just waiting to be made into something yummy. I often times will combine almond flour with a couple teaspoons/tablespoons of either coconut flour or psyllium husks as they tend to soak up more moisture and bind soggy things well. Thanks for the recipe! I made them last night, and they were gone before from the plate as fast as I could fry them. You weren’t kidding about the garlic taste- these guys live up to their name. You should have a cooking show, Id watch that over Rachel Ray anytime. looks delicious…..I don’t have any almond flour..what could I use instead? All I can say is wow!!!! I made these tonight figuring they’d be good, but I didn’t think they’d be THAT good!!! It was my first time frying with coconut oil, and I love the mild toasty coconut flavor the crunchy crust has. Your video was great, and I agree with the previous poster and would watch you over RR! We need a good primal cooking show on tv! Thanks again and keep those great recipes coming!!! To add one more thing, I used zucchini, and it worked perfectly!! Glad so many of you enjoyed the recipe! Joanna – It could be the arrowroot flour or maybe you just need to get more moisture out. As for dipping, think potato pancakes. You could go the sour cream or unsweetened applesauce route. Or guacamole would probably be pretty good! Shannon – I knew that coconut flour is super absorbent but haven’t used psyllium husk before – good to know. Sarah – I love the flavor that coconut oil gives fried foods, too! I’ve pretty much switched to coconut oil for all of my stovetop cooking that requires oil. Just fixed these tonight, and they were really good. I don’t usually care for yellow squash much without zucchini. The squash recipes from my childhood fall way short on the flavor scale. I’m glad to finally find a squash recipe that I like. Next time I’ll mix squash & zucchini together. I made them the couple of days ago and they were wonderful. Saved half the mix and fried the rest up the next day.. there was some liquid that had separated out but they still were awesome! I was actually searching for squash (racket sport), and I found the picture of your yummy recipe. Oh maaaan, I am glad I found it. Thank you for posting, and I am making it tomorrow!